So, this weekend is all about getting Nimrod ready for the season after her winter on the hard. She’s now back in the water with a new mainsail, stack pack, sprayhood and fridge compressor. We had taken a late flight out of Luton that turned out to be even later than planned as we didn’t get to the boat until around 1am. We made it to bed sometime after 2am as we needed to make it first! We also needed to connect the mains electricity and unpack. This was when we discovered that the new fridge wasn’t working. Very disappointing as we had paid €600 for a new compressor to be fitted. Peter, our caretaker, had been checking it regularly for at least two weeks but it stopped yesterday so the fridge man will be dragged on board first thing Monday to find out what the problem is. This morning we slept in a little but were awake for around 9 local time. Luckily, we have long life milk on board so we could have a cuppa first thing – otherwise Liz would have been unbearable! Peter came by and we went through the list of things he had done over the winter including checking the seacocks, getting a stainless steel bow protector template made so that the anchor doesn’t continue to chip the gelcoat. He’s done a sterling job looking after Nimmie. On way to the supermarket we decided to stop for some brunch – after all, we are on holiday (sort off). Food bought including ice and it was now time to start the long list of jobs. First up was putting the Genoa on. This is one we bought secondhand before we left the UK in 2012. We had had it valeted last year and packed it away. We decided we would try it this season as it’s bigger than our usual one so should be better in the lighter airs you can get in the Med. First of all, though, we needed to unfurl the furling line and wind it in anti clockwise rather than clockwise as the UV strip was on the other side to our usual one so would have ended up not on the outside when the sail is furled which kinda defeats the object of the UV strip. Once we had done that we were ready to put the sail on. Except that the cord on the luff of the sail was too big for the groove! So it will be back to the sailmaker to have a smaller cord fitted, which was a shame as we were hoping to have at least a day sail tomorrow to try out the new main and new to us Genoa. As we were using (or not using!) this Genoa, we wanted to see whether we could fit the old Genoa under the forward cabin bunk so we had a spare with us. In order to do that we needed to take out the cruising chute and spinnaker as well as the storm jib. Once we had all of these out, we decided we would take the spinnaker home as we never use it as we have the cruising chute, which is much easier to use with only two of you on board. We took the opportunity to inspect the storm jib and found that the brass snap on shackles were all green and furry so we then set about cleaning them before packing it away again. The only job we actually managed to complete today was turning the life raft upside down as it had been put back on the wrong way up. We did this carefully as we didn’t want to drop it into the water as it lives strapped onto the back of the boat! Then before we went out for a shower we thought we would check to see whether we could get Eurovision on the TV as Malta is in the final as well as the UK. No power to the TV! OMG, this had to be sorted. Luckily, it was only a loose connection behind the electrical panel so disaster was averted! A quick shower and off to the local Italian for dinner, watching Eurovision. Tomorrow is another day of jobs but at least she is looking very pretty back in the water in Malta. 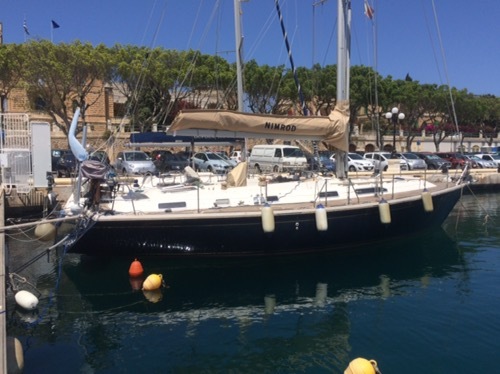 This entry was posted in Equipment, News and tagged 2016, Maintenance, Malta, Med. Bookmark the permalink. 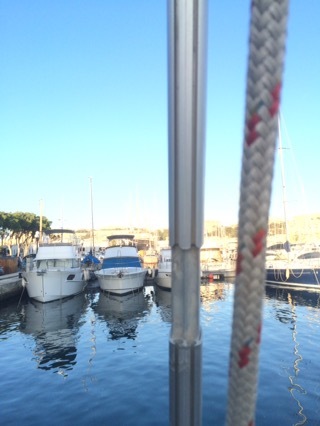 2 Responses to Who says it’s glamorous having your boat in the Med? Peter sounds amazing: good luck with all the rest of the sorting out. Malta did well last night, shame that the same cant be said of the UK entry.